If you’re looking for a president with a track record of boosting foreign intervention, expanding the surveillance state, and steadfastly backing Israel despite its war crimes, Joe Biden is your guy. In this series, Jacobin’s Branko Marcetic takes a look back at the career of Delaware’s longtime senior senator. Below is Part II: Biden, the Hawk. If the next president of the United States is a Democrat, one of their major tasks will be to stand up to the national security state. Back in 2008, Obama was widely thought to be that figure, campaigning (and winning) on a rejection of the Bush-era “war on terror” before entrenching and expanding it once in power. As the world watched Obama hand control of this machine to Donald Trump, it served as a sobering reminder of why any future Democratic president would need to take seriously the task of confronting the Washington consensus on national security. Joe Biden wouldn’t be that president. Biden has operated for nearly five decades in the Beltway. Over that time, on issues like foreign intervention, Israel, and the expansion of national security powers, Biden has proven himself a reliable representative of the national security establishment, a role he’d more than likely continue once in power. To be sure, Biden is no Hillary Clinton when it comes to foreign intervention. He’s registered some antiwar positions from time to time, as when he voted against the first Gulf War or opposed the funding of the Nicaraguan contras in the 1980s. But overall, he’s racked up a track record of supporting overseas adventures. 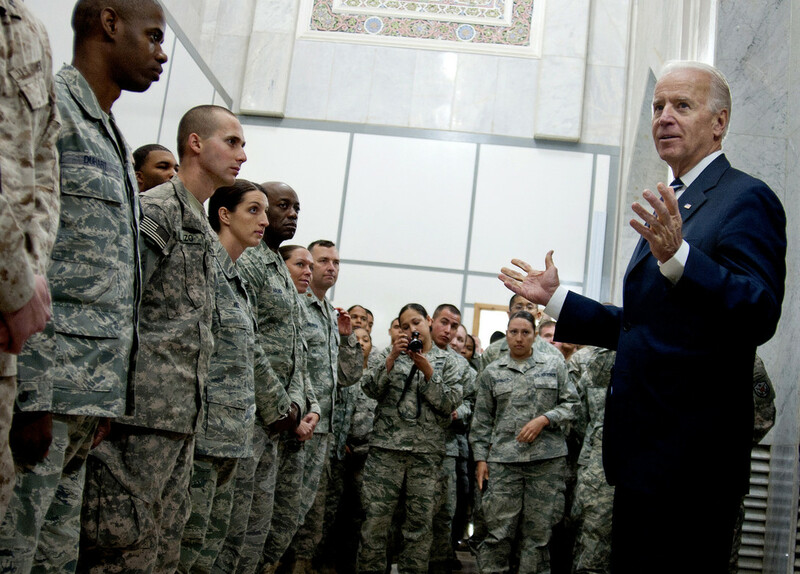 Biden wanted to send US troops to Darfur in 2007 and later suggested putting in place a no-fly zone. No one is in favor of permitting genocide, obviously, but as cases like Libya and Syria have shown, such military intervention often has far-reaching ramifications that lead to massive human suffering. Biden was also a key architect of the 1999 bombing of Serbia, which actually dissolved the local pro-democracy movement and rallied popular support around the country’s dictator. “I voted to go into Iraq, and I’d vote to do it again,” Biden said in August 2003. He also supported the war on Afghanistan, and his 2009 strategy for the war there appears to have served as the model for Trump’s current actions in the country. He even backed the UK’s invasion of the Falkland Islands. Biden has also been a consistent supporter of expanding NATO into what Russia considers its sphere of influence, a key driver of today’s planet-threatening tensions with the country. Biden called the 1998 NATO induction of three eastern bloc countries — a major provocation of Russia — “the beginning of another fifty years of peace,” coming only four years after the Clinton administration had explicitly and falsely assured Russian president Boris Yeltsin that the US wasn’t seeking to broaden NATO’s membership. While Putin is an authoritarian who regularly engages in political interference and mischief beyond his country’s borders, this doesn’t absolve Biden and others for baiting Russia’s leadership with what amounts to a sustained, long-term provocation. Biden has reportedly become more anti-interventionist since voting for Iraq, opposing the bombing of Libya, sending more troops to Afghanistan, arming the Syrian rebels, and even the reckless Bin Laden raid (though he went on to brag about the latter at the 2012 Democratic National Convention). These are all good things. But like other supposed non-interventionists, Biden’s aversion to military involvement only applies to ground forces en masse. He was a champion of what he called “counterterrorism plus”: a combination of drone strikes and special forces, which essentially became Obama’s approach to fighting terrorism. In other words, if you like Obama’s approach to fighting terrorism, with Biden, you can keep it. But Obama’s anti-terror strategy was controversial for a reason. While the lack of full-scale invasions made foreign intervention more palatable to the voting public, it also allowed the military to quietly broaden its involvement throughout the world, to the point where the news of four US special forces soldiers dying in Niger last year took many by surprise — chiefly because no one had no idea soldiers were even operating in the country to begin with. Worse, this approach has resulted in not just unspeakable brutality being visited upon ordinary civilians, but in feeding anti-American resentment in the region, ensuring the “war on terror” will go on and on. It’s an approach we can thank Biden for. The Overton window currently seems to be shifting on Israel and Palestine, with Democratic voters moving leftward on the issue, and various prominent politicians on the Left following them, Bernie Sanders among them. Lobbyists for the country bite their fingernails as the fastest growing US demographics are increasingly more sympathetic to the Palestinian cause. Yet under a President Biden, with his long, chummy relationship with Israel, the Overton window on this issue would likely be shut and padlocked. Biden’s has been known as one of Israel’s “close friends” in Congress for practically his entire political career. He disapprovingly lectured Israeli officials from time to time, as when he warned Menachem Begin in 1982 that Israel’s illegal settlements were hurting the country’s US popularity. But Biden has never exerted any real pressure on Israeli officials to change their behavior. At the same time Biden was supposedly “mad as the devil” about Israeli settlements in the 1980s, he was a reliable advocate for Israeli interests in Congress. When Jimmy Carter decided not to renew an agreement that gave Israel preference in buying industrial diamonds from the US at a negotiated price, Biden and four other Senate Foreign Relations Committee members wrote to him to reconsider. Only a month before his exchange with Begin, Biden voted to not only dramatically step up aid to Israel — over the objections of Reagan, no less — but supported a measure that would ensure US aid to Israel would forever be equal to the amount of US debt repaid by the country. This arrangement would end up being crucial for Israel to keep being furnished with weapons and cash by the United States. Due to a 1975 law, any country that fell behind on its loan payments by more than a year lost access to US aid. This change in policy effectively ensured Israel was always guaranteed to avoid this fate. Biden showered Israel with further rewards for its obstinacy. He again clashed with the Reagan White House over Israel policy, this time in December 1984, when he proposed giving Israel a generous Christmas present: a complete refinancing plan for what Israel owed to the US, then the largest per capita debt in the entire world, which was on top of an Israeli request for hundreds of millions dollars more in aid. The refinancing plan slashed the average interest rate on Israel’s US loans from the market rate of 12 percent to 5 percent. He wasn’t getting nothing in return for these efforts. Due in part to his frequently making the rounds of pro-Israel fundraising dinners, Biden managed to easily out-raise his opponents during his failed 1988 presidential bid, raising $1.7 million in just twenty-seven days. By the time his campaign crashed and burned within three months, his national finance chairman claimed he had raised $3.7 million, with another $1 million on the way. Biden’s ties to Israel lobbyists were key to this. The youth director of his 1988 campaign was a former AIPAC staffer, while one of his fundraisers sat on AIPAC’s national advisory council and had a hand in two pro-Israel PACs. His national finance chair got his start in political fundraising through AIPAC and other pro-Israel groups. According to the Washington Report on Middle East Affairs, Biden had been the pro-Israel lobby’s “anointed candidate” in the race, and after the election he continued to be among the top ten Senate recipients of money from pro-Israel PACs, receiving tens of thousands of dollars from them each year. By the end of his career in the Senate, Biden had received more than $410,700 from pro-Israel PACs and donors. Biden also profited another way. Common Cause found that in 1987, Biden was the seventh-highest recipient of pro-Israel honoraria — cash payments from private groups for attending events like private meetings and seminars, or for delivering speeches. Honoraria not only ran around FEC regulations, but it could be used by candidates to pay their personal debts. Biden had an important function in the pro-Israel ecosystem. He and other liberal Israel hawks served as the reasonable, “good cop” alternatives to more fervent, right-wing voices, helping to sell Israel’s demands to those in power. An episode from 1998 — in which Israel launched a public-relations and lobbying onslaught to stop Clinton from going public with a peace proposal to pressure then-prime minister Netanyahu from resurrecting the peace process — was illustrative. While a collection of right-wing hawks sent hard-line letters to Clinton and other lawmakers denouncing the plan, Biden and other liberals sent a gentler letter discouraging the idea. The two-pronged campaign worked and Clinton shelved the plan. In some cases, however, Biden has veered far to the right when it comes to representing Israel’s interests in Congress. Twenty-three years before Trump caused chaos by moving the US embassy to Jerusalem, Biden voted for the law that allowed him to do so, arguing that “to do less would be to play into the hands of those who would … deny Israel the full attributes of statehood.” During the 2000s, when Israel started carrying out its policy of “targeted killings” — also known as assassinations — Biden insisted the extra-judicial killings were legal and even criticized the Bush administration for condemning them. In 2006, AIPAC specifically thanked Biden and three other lawmakers for helping pass a law that cut off US aid to the Palestinian Authority unless Hamas abided by certain conditions. One would think these decades of closeness with the pro-Israel lobby, consistent devotion to Israeli interests, and friendship with Netanyahu would have paid dividends for Biden when he joined the Obama administration. He was, after all, “the best friend of Israel in the administration,” according to Chuck Schumer. But not only did Netanyahu relentlessly work against the administration in which Biden served, ignoring Obama’s calls to stop settlement-building and attempting to kill the Iran deal, but he went out of his way to humiliate Biden, announcing a new spate of settlements while he was visiting the country. Biden in turn told Netanyahu that his actions were “getting dangerous” for the United States and its troops, a response that was less a sharp rebuke than a limp plea. Nothing in Biden’s history suggests that he would use this current moment to break from business as usual on Israel. If anything, it suggests he may well work to shield Israel and its leadership from the wrath of an increasingly unhappy electorate. Besides this, Biden has also proven himself a reliable supporter of an ever-expanding national security state during his time in Congress. He of course served as Obama’s vice president for eight years, when that administration dramatically widened the government’s powers in the name of national security. But long before this, Biden had an iffy track record on civil liberties. In 1991, Biden introduced no less than two bills aimed at curbing terrorism and crime respectively, both of which featured language mandating that tech companies create “back doors” in their products for law enforcement to snoop through. Biden’s bill so alarmed one programmer, it spurred him to develop email encryption. Biden tried to water down encryption again three years later with a successful bill that expanded federal wiretap powers, but privacy advocates managed to remove this and other provisions from the bill before it passed. The year after that, in the wake of the Oklahoma City bombing, Biden introduced the Omnibus Counterterrorism Act on behalf of the Clinton administration. The bill made “terrorism” a new federal crime, allowed those charged with terrorism to be automatically detained before trial, outlawed donations to government-designated terrorist groups, allowed electronic surveillance of suspected terrorists, and created a special court to deport noncitizens accused of terrorism (ironically, when Bush had proposed a similar measure years before, Biden had denounced it as “the very antithesis of our legal system”). It also let the government use evidence from secret sources in those trials. The following year, Biden voted for Bob Dole’s Antiterrorism and Effective Death Penalty Act of 1996, which featured many of these provisions, as well as severely restricting federal habeas corpus review of court decisions: one appeal, with a one-year time limit. Legal scholar Lincoln Caplan called it “surely one of the worst statutes ever passed by Congress and signed into law,” and argued that it “gutted the federal writ of habeas corpus,” slashing the rate of state courts’ reversal of death penalty decisions by 40 percent. Many of the provisions in Biden’s 1995 terrorism bill were revived six years later in the Patriot Act. In the wake of September 11, Biden incessantly told anyone who would listen that the Patriot Act — which quickly became shorthand for the Bush administration’s overreaching on terrorism — was in fact practically written by him. During debate over the bill, Biden called it “measured and prudent,” and complained that the rest of the country had ignored his warnings about the dire threat of terrorism the previous decade. In fact, he lamented that the Patriot Act didn’t go further, regretting that measures allowing police to carry out forty-eight-hour emergency surveillance without a court order and letting them use accidentally illegally obtained wiretap evidence were removed. Biden can also take partial credit for the militarization of domestic law enforcement. His championing of the “war on drugs,” of course, played a large role in this. Biden’s vote for the 1981 Military Cooperation with Law Enforcement Officials Act, for instance, permitted the military to work with police on drug cases. But Biden was also a major proponent of the Byrne grant and Community Oriented Policing Services (COPS) programs, which in practice created more heavily armed police forces increasingly focused on locking up people for minor drug crimes. “You hear anybody say, any serious person say, that our investment in local law enforcement at a federal level over the last decade has been a failure?” Biden said to the National Sheriffs Association in 2005, as he griped about the Bush administration’s phase-out of COPS. He would later try and revive the programs. When it wasn’t drugs, Biden used terrorism as a justification to militarize law enforcement. He inserted a provision into the Patriot Act that allowed state and local departments to apply to get equipment needed to combat terrorism. This was beside the extraordinary surveillance powers the law granted to police, which they now casually use for drug and immigration cases. A few years later, of course, when it was politically popular, Biden became a fierce critic of the surveillance state set up by the Bush administration, and he voted against expanding FISA in 2007 and 2008, the latter of which served as the legal basis for the NSA’s PRISM program. Which Biden will the world get should he be elected: the civil-liberties champion who briefly rebelled against Bush, or the eager anti-terror warrior who thought the Patriot Act could’ve gone further? On several important issues, Biden has spent the vast bulk of his career out of step with the sentiments of not just the Democratic base, but, increasingly, the public as a whole. He’s been a proponent of an aggressive, if quietly interventionist, foreign policy, been one of Israel’s most reliable friends in Congress, and spent all but a brief period (when he was in opposition) expanding the national security state to outflank the Right. There’s little reason to think Biden would usher in a break from the past when in power, particularly as (aside from Israel), these are issues that are inconsistent, even fleeting, in animating much of the public. The next nominee must be someone who truly believes in breaking from the national security consensus — not just someone who may grudgingly do it only if they’re forced.